SAVE SAN LEANDRO HOSPITAL | A commitment by the Eden Township Healthcare District to help subsidize the short-term operations of San Leandro Hospital was unanimously approved this week even as the facility’s future remains in serious doubt following the transfer of title to property from the District to Sutter Health just three weeks ago. The plan approved by Eden Township Board of Directors Wednesday offers a projected $779,000 over two years in general funds to a potential multi-entity subsidy to run San Leandro Hospital in its current model as a general acute care hospital with emergency room services. The proposal is based upon the District’s projected cash flow for fiscal years 2013 and 2014 and would entail it contribute approximately $261,000 the first year starting in June 2013, followed by roughly $518,000 in 2014. No specific deal, though, from either the Alameda County Medical Center–believed to be in line to operate the hospital–the Alameda County Board of Supervisors, or the City of San Leandro is publicly known. After Wednesday’s meeting, ACMC Chief Operating Officer Bill Manns said he could not comment on whether or not any proposed plan includes Sutter leasing the hospital, which it official gained title Sept. 28, to ACMC. Manns also denied the specificity of any plan being for only two years, as referenced by the District board. Any plans to operate San Leandro Hospital in its current form, said Manns, must include an annual subsidy between $2 million-$4 million and require other government entities to provide assistance, in addition to the District’s pledge. The multi-million dollar subsidy figure has been generally accepted as fact over the years by most public officials. However, comments made Wednesday cast doubt over whether any short-term deal to rescue San Leandro Hospital is more of the same obfuscation from some county officials and Sutter. When Manns was asked by Eden Township Director Rajendra Ratnesar about the efficacy of a long-discussed “hybrid model” at the hospital, including general care, emergency room services and rehab services, he said the plan was not financially feasible, according to their modeling. “Part of the challenge with that requires building out approximately 12,000 square feet and the capital costs associated with that are fairly significant,” said Manns. “And so it reaches a lot longer to reach your break-even point.” To include acute rehab at San Leandro Hospital, Manns said, would require the initial subsidy to be higher. Mike Brannan, a representative for the California Nurses Association, encouraged the District to participate in the plan to subsidize operations at San Leandro and said of ACMC,“If that’s their commitment, I think we need to take them at their word.” Sutter’s continued presence in the future of the hospital still hovers over any deal, said Brannan. “The problem, of course, is once again, Sutter Health,” he said. “They have been the problem with the good-faith efforts this board and many others in the community have had through the last years for keeping the hospital open.” Brannan also called for a commitment longer than two years from ACMC and added there is skepticism any proposed deal between ACMC and Sutter even exists. 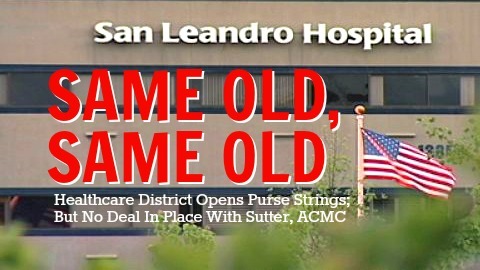 “It is my understanding there is no firm commitment from Sutter Health to turn the facility over to ACMC, or to turn it over without some serious strings attached,” said Brannan. Posted in Alameda County Board, Alameda County Medical Center, Bill Manns, Carole Rogers, CNA, Eden Township, mike Brannan, S.L. Hospital, san leandro, Steven Jones, Sutter, Sutter Lawsuit, Wilma Chan. Bookmark the permalink. Once again a chickenshit who hides behind anonymous to rail against the ex mayor. Hey clown, wheres your hero Cassidy who was going to save the hospital, oh yeah he can't do anything so he doesn't mention saving the hospital since dummies like you voted for him. How's Cassidy's plan for the Marina? Oh yeah BCDC just vetoed that yesterday. Why don't yoy grow some balls and use your name? 25 yrs for the marina , who hire a developer and not a consultant?? Hey douchebag no landfill into the bay everyone knows that,the marina is so far from even started…..the hospital has a better chance of survival now that it ever had in the last 3 yrs. And YEA MF when everyone uses their real name then I'll use mine… And voila! Tony originally spelt it as hybred on this blog. Anyone remember Hudson Bay? We have two airports aligning the bay. If we have a crash, what rescue plan is there in force with a silted up bay at about 12 inches deep? An airplane with 300 passengers needing emergency care? And one fewer emergency room in San Leandro? Can't use my real name. I would get fired by Sutter Health. But am a volunteer spy. Well here we go again starting with our past mayor all of this rhetoric and no one with any care for who will be affected if the hospital should close. and the vocabulary of many just shows their ignorance the words used come from gutter mouth types who know nothing of the situation other than what they hear from people like TS who is still one of the sorriest examples of a mayor we have ever known so I say to TS if anyone should apologize for anything it is YOU for where you have led the city during your tenure, I grew up in San Leandro and have watched it deteriorate into what used to be the worst parts of Oakland. So for all of you that want the hospital to close just think of all the people that will be affected if the hospital should close, we as a people are all in the same boat while here in this world and we should think of others and not just ourselves, so dont hope for pain, suffering and despair for your fellow humans, instead think of what you can do to try and help them, there is no better feeling in life than to know that you have helped someone else other than yourself, so I know some of you will never listen to reason but lets all try and its not really that hard to be your brothers keeper all you have to do is try. So here we are again cursing each other out and seeing fault in each other when we should be trying to help one another. So for me I will always stand for keeping the hospital open and seeing that others can get the medical care the people of San Leandro need. So until the final bell tolls, lets keep the Hospital open. Again not afraid to sign my name. I read that the District filed a malpractice suit against Craig Canizzo and his law firm. Anyone have more information?